The Equal Employment Opportunity Commission reports that, in fiscal year 2017, nearly half of all charges filed with the agency included claims for retaliation. What exactly is retaliation – and why is it a potential problem for so many employers? a “causal connection” between the two. Protected activity can include “opposing” unlawful activity – such as making an internal complaint of harassment – or “participating” in proceedings regarding alleged unlawful activity – such as testifying in a coworker’s discrimination lawsuit. Virtually any state or federal anti-discrimination statute is a potential source for a retaliation claim. Other federal statutes – such as the Fair Labor Standards Act (addressing proper pay practices) and the Family and Medical Leave Act – also can give rise to retaliation claims, as can state laws, including workers’ compensation and whistleblower laws. Importantly, these laws can provide the basis for retaliation allegations even if the claim underlying the protected activity ultimately is unfounded, or the request for leave (FMLA), accommodation (ADA) or workers’ compensation benefits is denied. Although adverse employment actions do not include every perceived unfair treatment in the workplace, they do include actions such as termination, a material change in job functions, an involuntary job transfer or a failure to promote. The third retaliation element, causal connection, often can be easy to establish, particularly when the adverse action takes place soon after the protected activity. All employers should have a clear, written policy against retaliation. The policy should spell out exactly what retaliation is and should make clear that the organization will not tolerate retaliation from managers or other employees. The policy should include a reporting mechanism with multiple avenues of reporting so that employees can report suspected retaliation before it escalates. All employees should understand what constitutes retaliation in the workplace. Managers, supervisors and human resources representatives need to know how to properly respond when an employee complains or participates in an investigation. Retain training documents and sign in sheets as proof of having taken practical steps to prevent retaliation. The fewer people who know about a complaint or other protected activity, the lower the chances of retaliation. 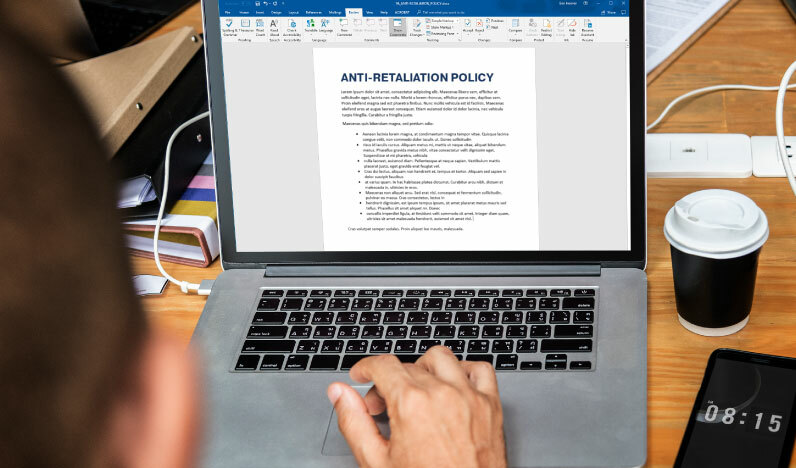 While some people will need to be aware of any given situation, keep that knowledge on a need to know basis and remind those individuals of the organization’s anti-retaliation policy. When an employee raises concerns, particularly those regarding discrimination or harassment, thank the employee for coming forward and explain that the organization takes all complaints seriously. Explain the organization’s anti-retaliation policy, and assure the employee that the organization will not tolerate retaliation. When considering any adverse employment action, review whether the employee has engaged in protected activity such that the adverse action could be viewed as retaliatory. Weigh the retaliation risk carefully, follow relevant policies and avoid treating the person more severely than other employees who have engaged in similar misconduct or performance problems. When in doubt, employers should consult with experienced human resources professionals and/or labor and employment counsel about the appropriate course of action. For MEA members, the Hotline and a Member Legal Services attorney are available to provide this assistance.